Congratulations to Stacy, the winner in the LOVE IS MURDER giveaway. Thank you to all who participated. 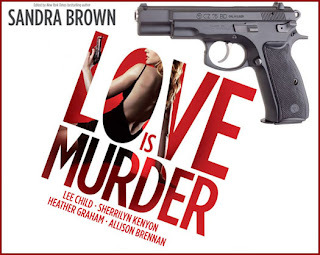 Today we feature Debra Webb's contribution to the thrilling anthology LOVE IS MURDER, edited by Sandra Brown. I had the pleasure of reading Dirty Low Down by Debra, and I think the thrill of this story stems from us being able to watch a woman tackle something that we ourselves could never fathom doing. We envy this character, we aspire to be like her...but in the end, she is in the car with a serial killer and we are sitting safely on the couch. Debra creates characters that make you want to better yourself and for that, and for all the romance and suspense she provides us with...I applaud her. *One lucky person to leave a comment today will win a copy of LOVE IS MURDER! Temporary Command Center, Houston, July 8, 9:30 p.m.
"This is a bad idea, Jackie." "You think?" Seriously. Some jerk-off tortures and murders five women in the space of as many months? Yeah, that really was a bad idea. Helping out with the official sting to take him down? A flippin' stellar idea. My partner should just get over it. "Look." Dawson cast a wary glance at the cops on the other side of the room before huddling close to me. "These guys can't guarantee your protection. This whole operation hinges on dangling you as bait. I don't like it." Bio: Debra Webb, born in Alabama, wrote her first story at age nine and her first romantic romance at thirteen. It wasn't until she spent three years working for the military behind the Iron Curtain-and a five-year stint with NASA-that she realized her true calling. A collision course between suspense and romance was set. Since then she has penned nearly one hundred novels. Visit her at www.debrawebb.com. Follow the LOVE IS MURDER Blog Tour!! 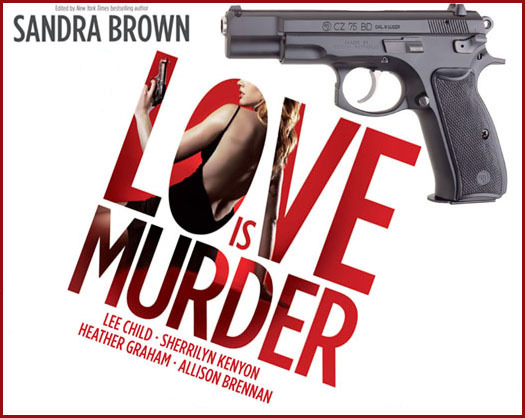 Prepare for heart-racing suspense in LOVE IS MURDER (MIRA Books, June 2012, $24.95 U.S./$27.95 CAN. ), edited by New York Times bestselling author Sandra Brown, this original collection features 30 of the hottest bestselling authors and new voices writing nerve-racking romantic suspense today. *Giveaway ends 11:59pm EST June 26th. Please supply your email in the post. You may use spaces or full text for security. (ex. jsmith at gmail dot com) If you do not wish to supply your email, or have trouble posting, please email maureen@justromanticsuspense.com with a subject title of JRS GIVEAWAY to be entered in the current giveaway. This giveaway is applicable to US and CANADA mailing addresses only. You won't regret it, Cris! LS, you can get this one first! The anthologies aren't connected! But they are all fantastic! Sign me up, love to win a copy of this book. It is on my wish.list. some of these authors are my favorites. Trish, this anthology offers one of the last stories that Beverly Barton wrote. She was such a treasure and will forever be greatly missed. I look forward to reading your contribution to "Love is Murder". You certainly HOOK me at the very beginning of all your books! Please enter me in your draw. I don't want to miss this one! Thanks, Jan! And if you want to read a bigger story about Jackie and Dawson, check out DIRTY! LOVE these authors.. Romantic suspense is my favorite genre..
Good morning, all! This is an amazing collection of stories by some mega-talented authors. I am honored to be among them! SO MANY AUTHORS SO LITTLE TIME CANT WAIT TO READ THIS ONE THANKS FOR THE CHANCE AND KEEP UP THE TERRIFFIC WRITING. Lots of terrific authors! I enjoyed several new authors I hadn't read before like Andrea Kane and Jon Land. Tomorrow is my birthday. This book would be the best birthday present! I love all these authors. Happy birthday in advance, Tammy! So many of my favorite authors have contributed stories to this anthology! Me too, Mary! I'm working on #4 now! 30 days of reading another great story - you can't beat that, especially when so many of my favorite authors contributed! Hey Karen! What a great way to spend 30 days! Hey! Good luck! JRS is awesome for offering such a great giveaway! Amazing giveaway! Glad I found your site! Great to have you here! You will want to visit this site OFTEN!!! It's amazing! I love reading your books for Harlequin Intrigue. This book looks great with several wonderful authors contributing. Hi Sandra, the Colbys are like family to me. I hope to do them FOREVER! Oh I have been looking at this book, but have not gotten it yet. What a great group of authors to enjoy! Colleen, ITW comes up with some great groups! Big fan of Debra Webb! So why didn't I know that this anthology is the third? I must be living under a rock. Loving the Faces of Evil series. Can't wait for Power to come out. Also working my way through the Colby Agency. I even found a few at my favorite indy book store recently and got so excited I thought they might kick me out. It is a shame I didn't pay more attention to the Harlequin Intrigue sooner. I have a ton of reading to catch up on! Thanks, Heather! This is my first ITW anthology and it was a blast. THe story is related to my Jackie Mercer series and the debut novel, DIRTY, available on Amazon and all. The authors in this antholy I have read I already adore. Others I already have on my reading radar. Debra, I can count on your story to have great dialogue and action. Those are things I look for in thrillers and romantic suspense. So excited for this anthology. Great stories and a lot to learn from! If I don't luck out and win, I'm using my prized $25 Amazon gift card to buy it! I haven't read any books by any of the authors in the list! I am constantly learning of new authors on this site and my TBR list continues to grow. I look forward to looking up your other books, Debra! Thanks for the post! I would love to read this one! It has some of my fav authors in it! This book has all of the authors I follow. I also love the book cover. This book might weight a ton with so many authors and stories.